CertifyMe.net offers OSHA compliant certifications. All courses are easy, affordable, and 100% online for your convenience. Choose the OSHA Certification or course you need and start it today! Call 888-699-4800 to get started. Our OSHA certification classes and training sessions are designed to help you become familiar with wide-ranging safety techniques for operating forklifts. CertifyMe.net offers OSHA certification classes for all kids of forklift drivers – from beginners to experts. All of our OSHA certification courses are completely affordable and online. Check out our OSHA certification classes that can each help your workplace prevent accidents and injuries. The key to becoming a safer forklift driver is to avoid accidents in the first place. With our OSHA certification online program, you can choose the training sessions necessary to help you become OSHA compliant in no time at all – at very affordable prices! Whether your employees drive forklift or vehicles for work, Defensive Driving courses are essential to keep your workers safe on the road and to avoid hazards. We offer four driving courses: Distracted Driving, Defensive Driving, Driving Safety, and Driving Safety Basics. All of these OSHA certification courses are 30 minutes long and are compatible with any SCORM conformant learning management system. Help prevent accidents by getting your employees OSHA certified in defensive driving. Learn more today with our specialized defensive driving classes. This is one of our most popular OSHA certification courses! If any of your employees work around or with asbestos, the Asbestos Awareness program teaches workers of the dangers associated with asbestos, where it’s often located, and how to limit their exposure. This course is online, only 45 minutes long and is divided up unto easy-to-follow sections. Any class IV employee in the country qualifies for asbestos awareness certificate. 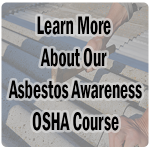 Like our other OSHA certification classes, our Asbestos Awareness training covers all the crucial safety concepts you need to know. Call for more information and get your OSHA certification online today! Many companies aren’t up to speed with their OSHA certification, and it shows with certain recordkeeping practices. Properly documenting your safety program is important – and we’ll teach you everything you need to know in this OSHA certification online course. Did you know that all work-related illnesses, injuries and fatalities are required by OSHA to be recorded and reported? Are you confused about OSHA’s new recordkeeping rules? Learn everything you need to know about keeping workplace records with our OSHA Recordkeeping class in order to make sure you are staying OSHA compliant. You have questions about recordkeeping – and CertifyMe.net has the answers, thanks to this OSHA certification class. Learn more here! If your employees are vulnerable to heat stress, you should make sure they receive heat stress training to ensure their safety. 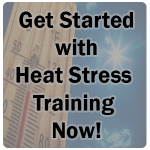 Teach your employees the symptoms of heat stress, OSHA’s standards for heat stress prevention, and how to stay protected with our Heat Stress training. Don’t take chances with your safety training program. If your employees or co-workers require heat stress training, this OSHA certification course will teach you everything you need to know. Hazardous Waste Operations and Emergency Response (HAZWOPER) training is an OSHA requirement for anyone who handles hazardous materials or waste. Many times, companies aren’t sure what exactly qualifies as HAZWOPER work. Take the guesswork out of your safety program with CertifyMe.net OSHA certification classes, including this informative, easy-to-learn program. Avoid fines or other penalties by making sure you are OSHA compliant and get HAZWOPER training through our easy online certification program. 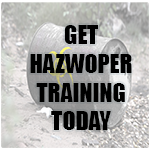 Learn more about HAZWOPER training here. Already have your HAZWOPER certification? CertifyMe.net also offers an 8 hour HAZWOPER refresher course. Learn more today! Many injuries and fatalities have stemmed from lack of proper scaffolding safety training. CertifyMe.net offers four courses that teach the proper protocols, including recognizing hazards and reducing risks of injuries, for employees who work with scaffolding. 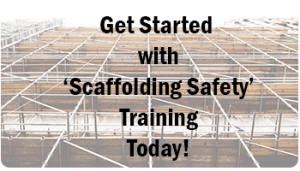 Employers can benefit from our Scaffolding Safety Training courses by keeping their employees safe and facilities OSHA-compliant. Scaffolding safety issues are always on OSHA’s radar, simply because there are so many accidents and injuries related to improper scaffolding use every year. But with our four online OSHA certification classes, you and your co-workers will have the required skills & knowledge to use scaffolding the right time – every time! Register for our four training programs today! Bloodborne pathogens can be incredibly hazardous in specific lines of work, including industrial and healthcare facilities. It’s crucial for employers to ensure that workers are properly trained and prepped for potential dangers while on the job. Our Bloodborne Pathogen Training OSHA certification is a great tool for becoming a well-rounded safety resource at your company – not to mention, it’s also a fine addition to any job profile! 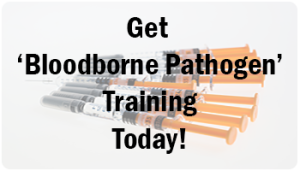 CertifyMe.net offers easy and affordable Bloodborne Pathogen Training for your employees. Learn more today! 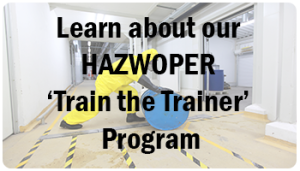 Our HAZWOPER Train the Trainer Program equips trainers with the knowledge and skills to teach other employees the critical concepts of handling hazardous materials. Hazardous Waste Operations and Emergency Response (HAZWOPER) certification is crucial to creating a safe environment for your workplace – start training your own employees today! CertifyMe.net’s online DOT HAZMAT Training program prepares and trains your employees in handling or transportation of hazardous materials. Our program includes the required general awareness, safety, and security classes. 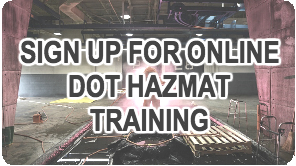 Ensure safety in your workplace and dodge heavy OSHA fines by signing up for our easy, affordable online DOT HAZMAT Training courses today! Sign up for any or all of our OSHA certification classes today. They’re ideal for any forklift driver that wants to become more qualified. Employers and employees alike will find every CertifyMe.net OSHA certification course easy to learn, and incredibly informative as well. Call 888-699-4800 to get started. Have recent circumstances or inspections confirmed that your workplace needs training? CertifyMe.net offers multiple types of OSHA certification courses that are already done for you and can have you quickly back on OSHA’s good side with a safer workplace and employees who are equipped to prevent accidents. CertifyMe.net specializes in the OSHA trainings and other safety-related content that your forklift drivers need to perform their jobs as safely as possible. Without the proper OSHA certifications implemented in your workplace, employee confidence can suffer – not to mention a surprise OSHA visit can result in large fines and / or legal action. We have affordable, effective OSHA trainings to ensure your warehouse, distribution, work site or other environment runs smoothly – and more importantly, safely! Our OSHA certifications can be taken online, off-hours, during lunch breaks or whenever they’re convenient for your forklift drivers. Our philosophy is simple: provide the most comprehensive, budget-friendly OSHA trainings available anywhere. With 24/7 access, built-in OSHA compliance, free 3-year renewals and learn-at-your-pace flexibility, there’s simply no other OSHA certifications and courses that will better prepare your forklift fleet. Contact us today to learn more. OSHA, the Occupational Safety and Health Administration, is a sector of the United States Department of Labor that started with the approval of the Occupation Safety and Health Act of 1970. Congress created OSHA to help set stricter standards for workplace safety with the mission to improve work environments and reduce accidents through safety protocols and OSHA certification training. OSHA handles workplace accident investigations, enforces safety standards, and much more. Current law states that all employer are responsible for employee training – so sign up with our OSHA certification classes today! Do You Need an OSHA Certification? According to OSHA, it is your responsibility as an employer to provide a safe workplace free of hazards, and to make sure employees are updated on all the right trainings. • Is additional training required? Have we experienced more accidents than normal, or failed a recent safety inspection? • Is training recommended to improve safety and health? Have we introduced new types of hazardous materials, equipment, or procedures? • Do I want to prevent accidents through properly trained workers? Our online OSHA certification courses can be taken from any device with an internet connection, at work or at home. Rather than wonder how you’re going to get your workplace trained with all the most important OSHA certification courses, choose CertifyMe.net and simply purchase our OSHA-compliant programs. With OSHA trainings for warehouse forklifts, pallet jacks, rough-terrain forklifts (perfect for construction site OSHA certifications) and more, CertifyMe.net offers one-stop shop convenience – and the peace of mind knowing your entire workforce is OSHA compliant. It’s hard to put a price tag on that, but rest assured, our affordable pricing program makes it easier than ever to get OSHA certifications implemented in no time at all! Choose the training program you need for your business, remain compliant with OSHA standards, and provide all of your employees with the OSHA certification cards they need, all with the fast and affordable online courses from CertifyMe.net!